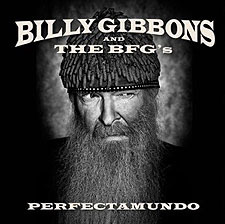 Billy F Gibbons, internationally known as the front man for multi-platinum blues-rock legends ZZ Top, is now touring (along with his band, The BFG's) in support of his debut solo album, the brilliantly-titled, Afro-Cuban influenced Perfectamundo. Indeed, in the middle of several U.S. dates, the tour finds its way to Cuba, where Billy will play the Havana Jazz Festival – a perfect place for him to play his new album, given that it was initially inspired by an over-the-transom invitation to perform at last year’s Havana Jazz Festival. 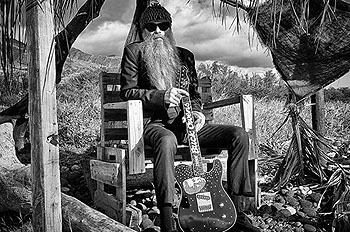 The musical genius of Billy F. Gibbons is to be heard on his first ever solo album; refreshingly unexpected, but most predictably. Perfectamundo. ¡Escuchemos! Chatting recently with the man himself, guitarist Billy F. Gibbons, and taking it from the top, and being that, and after all these years, PERFECTAMUNDO is his debut solo album, I wondered why it had taken him so long to "break free" from the other two?! "Whoa! This endeavor is not, in any way, a vehicle to “break free” from my ZZ Top bandmates, Dusty Hill and Frank Beard. 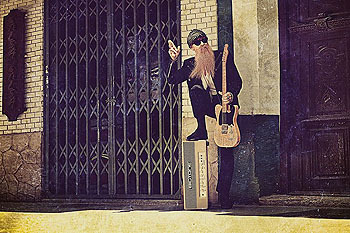 ZZ Top's the main man very much committed to keep on keepin’ on for a long, long time to come. "Perfectamundo" is the exploration of some sonic territory quite different from ZZ Top’s wheelhouse. The accomplishment is the Afro-Cubano thing you’re feeling." Is the title, PERFECTAMUNDO a term you honestly use frequently in your every day life? "Sure, if something works out to your satisfaction and addresses the moment in a significant way, well, it’s “Perfectamundo”…! That’s certainly a sound reference toward this album." Looking at the front cover of the new album, what was going through your mind for that one photograph you/they chose to be the cover album shot? "That's one great shot by the lensman in Vienna, Austria, Rene Humer which truly underscores this solo outing. It’s a funky image where I’m captured in mid wink." The album has an Afro-Cuban musical flavor to it, so I assume that it was your time spent with Tito Puente back as a youngster, that embedded these influences within you - but what was it now, here in 2015, that empowered you to record an entire album in such a musical style? "It was an invitation to appear at the Havana Jazz Festival that stimulated thinking toward a sonic flavor appropriate with the event. That’s when the views from Tito Puente's perspective presented themselves and we jumped right back on that bicycle that we hadn’t ridden in so long." With regard the runners and riders on this album, and knowing this question is much like asking a father who his favorite child is, which musician(s) made PERFECTAMUNDO what it is, just because of their participation? "Can’t say enough about our bandstand lineup. Mike Flanigin, our Austin, Texas B3 Hammond organ stylist started things up and running with some fierce keyboard pounding. We guested on Mike’s recent solo release “The Drifter” which in some way is a favor returned." "Also tipping the hat to Alx “Guitarzza” Garza, our hip-hop poet and percussionist. "G.G." Martine is genuinely South of the Border fueled flying fingers across the ivories. On the backline are two brilliant drummers who happen to be female coming on tour with us: Melanie DeLorenzo and SoZo. I think we’ve got massive firepower behind it all"
Your tour comes to Detroit on January 31st, 2016, so are we going to hear one or two Motown songs from you that night, perhaps? "Yeah, we’re set to play Detroit’s Scottish Rite Cathedral at the Masonic Temple. The idea of an adaptation with a Motown song for the occasion is intriguing. Will take that under advisement." Being that you've finally released a solo album, and being that you've tackled a different-from-ZZ Top genre of music, is there another genre of music out there you would like to next have a solo crack at, so to speak? "What you got…? There's always Reggae, Country, New Orleans and Western Swing… We’re just keeping an open mind." From your days with the Moving Sidewalks (1967) through to today, some nearly 50 years later, in all honesty, what are some of the most important things you have learned along the way in a) Music, and b) Life, in general? "a) Play what you want to hear, and b) Do it with determination." Billy, if you could sum yourself up in just 3 words, what would they be? "Tone, taste, tenacity…!" Finally, and throwing you a journalistic curve ball, Exclusive Magazine loves Penguins (the bird) ... do you?! "Of course!! Who doesn't stand in admiring wonderment of flightless birds in tuxedos? They hang with their mate forever. I believe we can relate! Rock on!" Jan. 20 – Washington, D.C.
Jan. 22 – Lexington, Ky.
Jan. 23 – Atlanta, Ga.
Jan. 24 – Orlando, Fla.
Jan. 26 – Nashville, Tenn.
Jan. 27 – Charleston, S.C.
Jan. 29 – St. Charles, Ill.
Jan. 30 – Milwaukee, Wis.
Jan. 31 – Detroit, Mich.
Feb. 2 – New York, N.Y.
Feb. 3 – Boston, Mass. Feb. 4 – Ridgefield, Ct.
Feb. 6 – Stroudsburg, Pa.